I promise, I cooked for my company... it is just, well, I know you really care about what we drank. This year, I have been obsessed with all manner of DIY drinking. I have concocted my own root beer, my own tonic and my own gin. My kitchen is beginning to look a bit like the lab at Hogwarts. My root beer left something to be desired. It was way too molasssasasasy for me and not quite sweet enough. I need to work on a new sugar content quotient. In the meantime, the gin was lovely. My favorite gin of all time was made in Vermont. It was called "veranda" and it tasted exactly like you were sitting on a veranda. It was light and spicy and divine. The company folded and I was bereft. I still have a tiny bit of Veranda gin tucked away for a final G&T come Armageddon. While I wait for the end... I whipped up my own gin and I must say, I did myself proud. 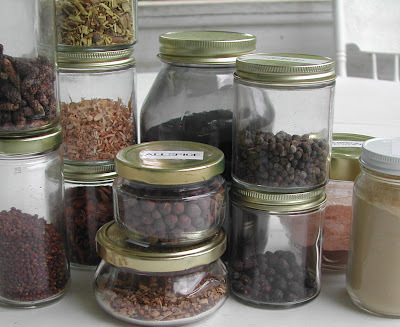 Place all the aromatics into a large glass container. I have a large distilling jar, but any glass container will work. Leave in a dark place for 2 to 5 days. 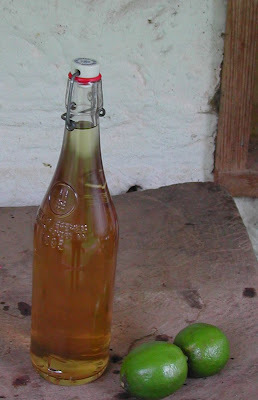 Strain* the mixture and bottle. There are several ways to strain the gin and they all have flaws. If you use a Brita pitcher, you can strain it like you do water. You need to set aside a special filter as your libation filter. It will work great for the first liter, but after that it begins to clog and the process grinds to a halt. And it is two days before you have water again. Cheese cloth is an option, but it needs to be at least four-ply. Coffee filters are another option, but you must strain it a bit at a time. After some experimentation, I use a foam skimmer, like one uses in preserving, for the first straining to get out all the seeds and peals, then I strain it again through non-bleached coffee filters. That did the trick. There exists a company called Gray Kangaroo. they produce a liquor filter that is supposed to be top-notch. I have never used it, but it looks like it might be just the thing for those DIY drinkers out there. Where in the world, you might ask, does one find cubeb peppers, and liquorice root and other herbs and barks to concoct delicious drinks of your own creation? Berkley, of course. I am terribly fond of Lhasa Karnak. They are on line but very low-tek. You e-mail them a list and your credit card gets charged and soon a box arrives at your door. you can buy in small batches, which is advisable until you decide what you want to add to your aromatic blend. Not that I object, but really, EVERYBODY brings wine to parties... so be different! Next time, BYOG! Loved Veranda Gin, never thought I'd see it again. Although, I also have a smidgen left - for a special, and maybe terminal occasion. But this gives me hope. Never tried the DITY path, but will certainly give this some consideration.